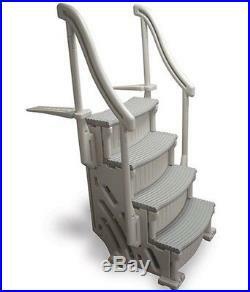 The newest above ground swimming pool stairs from Confer! These above ground swimming pool entry steps are designed to impress any onlookers, and manufactured to last for years to come. The attractive two-tone color -- warm grey panels and handrails accented by grey treads -- will compliment any pool, while still maintaining the strength and durability to hold up to 400 pounds. Pair this with CCXAG2 from Confer to create the perfect system! Tread width: 27" - Tread depth: 10" - Riser height: 11. Height to top tread: 36. Handrail height (from top step): 30. Start with the base step unit (staircase) and then expand into a complete Curve system at any time. Curve system has the sweeping wedding cake look that many homeowners want in a pool step. Four tread unit is for above ground pools. Three thread unit is for inground pools. Above ground unit can be assembled with treads curving inwards or outwards depending on customer preferences. Two tone color grey treads with warm grey (beige) sidewalls and handrails. Adjustable base pads to compensate for a slightly-dished pool floor. Easy assembly with no hardware required. Arrival time will depend on your location. If you have any questions, feel free to ask. The item "Confer CCXAG 4 Step Above Ground Swimming Pool Grand Entry Steps Stairs CCX-AG" is in sale since Wednesday, October 8, 2014. This item is in the category "Home & Garden\Yard, Garden & Outdoor Living\Pools & Spas\Pool Equipment & Parts\Pool Ladders & Steps".281" and is located in Saginaw, Michigan. This item can be shipped worldwide.